Couldn’t find a better day on the farm! Sunny day on the farm. 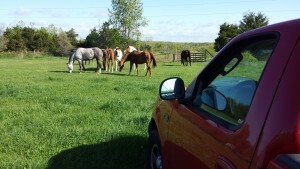 The horses are enjoying the green pasture. I wish I could spend all day with these guys. It is so beautiful and peaceful at the farm. Soon it will be time to bail hay! One of Trish’s Favorite times of year is when she gets to start feeding her hummies! 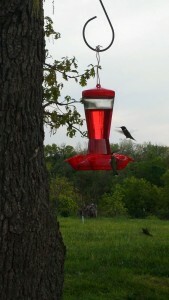 We saw our first Humming bird of the season this last weekend. Now there are about 8 fighting over the feeders. They fly from the one feeder to the other. It is a lot of fun watching their aerial displays. Our sows were getting ready to farrow in March and a cold snap was about to hit. We threw together these farrowing pens in our barn. We used pallets to make the walls and to make the divider to the creep area. This set up worked very well, but they were not as sturdy as what we were shooting for. Our sows tore through the creep divider with ease and they had to be reinforced and straightened up daily. 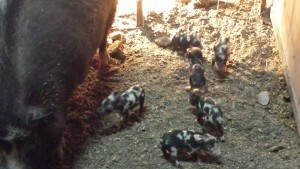 The new piglets also found the weakness in having pallets, they crawled through the fork spaces and wandered around. The creep area worked very well to keep the babies safe. 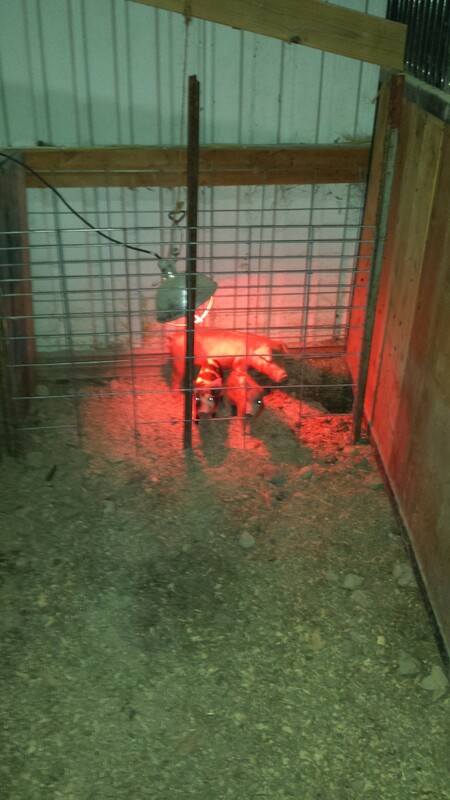 Adding a heat lamp made it a perfect nursery area. When Momma called they all piled out and started eating. We have upgraded the creep divider to a hog panel. We turned it upside down and enlarged 2 holes so the piglets can easily get in. 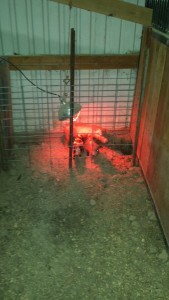 The heat lamp and the babies are protected from the sow. We also went from 3 pens down to 2, added an ally between them for better access. 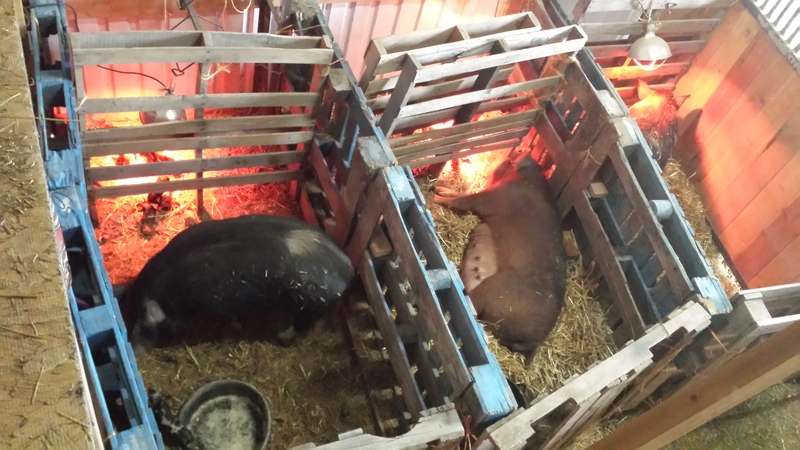 We have 1 Hampshire sow in the new setup. So far she has not revealed any flaws. Hopefully we have babies soon, I am getting excited to see how the new divider works, and how well it will hold up. I will give an update when we give our final evaluation on the design. There is a way to get great farm raised meat without having to buy the whole hog at once. Our CSA ( Community Supported Agriculture) program offers a share of 15 lbs. of meat each month. Plus, Discounts off of our retail prices are given for pre-payments of 3 months, 6 months, and 12 months shares. We put our CSA customers first. Their orders are filled first. Plus we try include bonus products that we produce here on the farm when we can. We will be implementing new CSA pricing options in the fall. The new options will include a Premium share of Ossabaw Island pork, or a Standard share of pork from one of our other fine breeds. Our current Members will continue to enjoy Ossabaw Island and Ossabaw Island cross pork for the duration of their share purchase. So if you buy in before our new options are implemented, you will be grandfathered into our Premium share. Our Egg CSA is will be starting up soon. The hens are ramping up to supply us with great farm-fresh brown eggs. Get signed up now! Orders will be limited starting out this Spring. Spring is an amazing time on the farm. Spring Babies, Spring Gardens, Spring Flowers, and Spring Showers. One day of sunshine for every 2 days of rain. Our farm is soggy. I am hoping to get the garden started, but it is just to darn wet. My excitement to get rolling on planting is making me have no patience. Mentally planning the garden is just not the same as getting it done. There is nothing quite like a surprise Rooster Flogging on Easter. I was just telling my niece not to worry while picking the eggs, that they won’t do anything. Luckily, I bent down to pick up the last egg from the nest box. Right then wham!! Rooster Flogging!! It jump onto my face hit me with its spurs and pecked me at the same time. He was so quick I couldn’t even defend myself. That little pecker is lucky he was one of my favorites. I had an inquiry about the fencing requirements for pigs, and what works best. I have practical experience, but I am no expert on fencing. I can only tell you what has worked for me on our farm. My personal go-to for fencing is pig panel. 16′ welded wire panels that are spaced for raising pigs. They are approximately 3′ tall and are narrow spaced on the bottom and wider spaced on the top. The narrow spacing by design is to keep the young pigs in, but I have seen little piglets run full speed and jump through the upper larger spaced area. So it may slow them down a little. I have not had a full grown hog go over one yet, but they can eventually separate the seams of two panels and escape. Daily visual inspection of any fencing for hogs is a necessity. Woven wire with spacing like the welded wire can also work if stretched tight enough and with posts close enough. Pigs will dig next to the wire and then lift it with their noses to crawl under the fence. This seems to be a younger pig trick, as they get older and fatter they tend not to try it. Electric wire will also work fine if the pigs were properly trained to respect it. A 2 or 3 wire system will keep most pigs in. I used this successfully even to separate breeding groups and boars. the fencer needs to be strong, and daily inspection of the fence is necessary to make sure they have not pushed dirt onto a lower wire to short it out. Fencing is really a personal choice. It may depend on what you have available, or what budget you have to get started. Electric wire is the cheapest per foot of fence, and the pig panel is the most expensive. I have had all three in use at the same time. No matter what fencing I have up, I find the best way to keep them where I want them is to keep them adequately fed at all times. I also bucket feed twice daily, if one does get out, it will come running back to the bucket.